Make lace work for the office! All you need is a simple white top and you're set! Go printed with a knee-length pencil skirt that's whimsical yet conservative. Pair it with a classic button-down shirt and pointed-toe pumps to ensure you're boardroom-ready. A turtleneck sweater is a great option for those of you who don't want to think too much about extra accessories. The high funnel or draped cowl neck gives your office look an extra dimension of detail without extra fuss. If you're not ready to give up on your cotton T-shirt just yet, turn it into an office staple by tucking it into a printed pencil skirt and throwing a tailored blazer on top. Turn to materials like leather or suede when dressing for work. We love this high-waisted style, nipped in with a wide belt. Be a proud African or show appreciation or admiration for the colourful African print pencil skirt, toning it down with white tank top. Accessorizing with waist belt could make you that style girl. 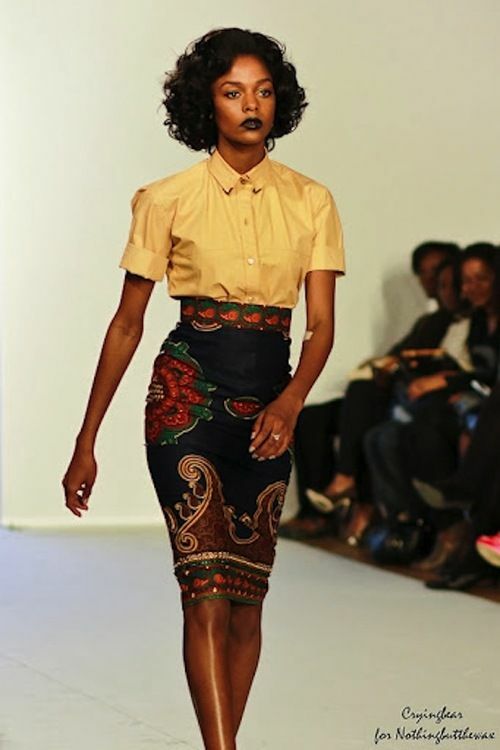 You can get one of those stylish pencil skirt at a moderate price in Ghana and Nigeria.